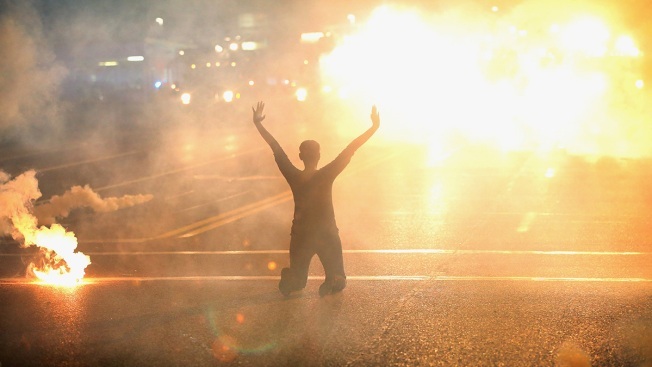 In this August 17, 2014, file photo, tear gas reigns down on a woman kneeling in the street with her hands in the air after a demonstration over the killing of teenager Michael Brown by a Ferguson police officer in Ferguson, Missouri. MarShawn McCarrel of Columbus, Ohio, shot himself in February 2016 outside the front door of the Ohio Statehouse, police said. He had been active in Ferguson. Edward Crawford Jr., 27, fatally shot himself in May 2017 after telling acquaintances he had been distraught over personal issues, police said. A photo of Crawford firing a tear gas canister back at police during a Ferguson protest was part of the St. Louis Post-Dispatch's Pulitzer Prize-winning coverage. In October, 24-year-old Danye Jones was found hanging from a tree in the yard of his north St. Louis County home. His mother, Melissa McKinnies, was active in Ferguson and posted on Facebook after her son's death, "They lynched my baby." But the death was ruled a suicide. Bassem Masri, a 31-year-old Palestinian American who frequently livestreamed video of Ferguson demonstrations, was found unresponsive on a bus in November and couldn't be revived. Toxicology results released in February showed he died of an overdose of fentanyl.